My father recalls that his family (before he was born) used to attend church in Brayton, but that the church relocated to Glad Valley after a big wind storm. At least, this is what his family told him. After that, until most family members moved to California early in WWII, the family attended church at Glad Valley. I don’t know whether something was lost in the telling of the story about the church, but a volume that I located, “Builders of God’s Kingdom: The History of the Catholic Church in South Dakota” by Sister M. Claudia Duratschek tells a slightly different story about wind storms and the founding of the Catholic church in Glad Valley. Memories can be a tricky thing, and it certainly is possible that the story as Sister Duratschek tells it is correct. Or, perhaps my Dad’s version hones closer to reality. It is difficult to tell for certain. The difficulty of finding out about the church is also evident in my search to see what became of the church building, which is no longer at Glad Valley. Last year, Rex Witte, one of the few remaining residents of Glad Valley, could only tell me that the building had been hauled away years ago. Hope Reformed Church or Church of God? Perhaps knowing with certainty awaits my next trip to Isabel, which could be months away. Notwithstanding, I would like to see for myself the church that my Dad, his siblings, and mother and father all attended. Editor’s note – To be fair, Father Lane’s secretary also emailed me separately, but one doesn’t always know who might or might not be bothered about being quoted online. Hopefully, Father Lane doesn’t mind! One of the last military engagements on the Plains happened in 1907 just ten or twelve miles from Thunder Butte near the junction of the Moreau River and Thunder Butte Creek and the present day Cheyenne River Sioux Reservation community of Thunder Butte. Today, the incident is probably long forgotten by most people, including those with long ties to the area. Yet, when it happened, it prompted coverage in the New York Times and other newspapers across the country. The episode began when about 400 Utes began a trek across Utah, Wyoming, and Montana in 1906. They were rounded up by the U.S. Cavalry and taken to Fort Meade in the Black Hills, where they were interned until plans for their resettlement in South Dakota were made. 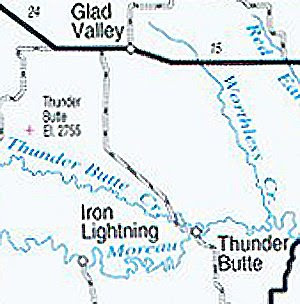 Ultimately, the Federal government attempted to resettle the Utes on the Cheyenne River Sioux Reservation at the Thunder Butte substation. However, from the beginning, the conditions of resettlement proved irksome for the Utes and there were threats of an armed rebellion. One of the complaints of the Utes was that the government’s promise of rations was not met. Instead, the government was requiring that work be exchanged for “payment” of rations. Commissioner Leupp of the Bureau of Indian Affairs commented to the New York Times, “This office believes in applying the same rule to the Indians that is applied to poor and ignorant men of any race. We believe in finding work for them, and then in permitting them to go hungry if they will not accept the opportunity to make a living. These Utes contemptuously declined to work….” Ute leaders may have been contemptuous of the Bureau of Indian Affairs, but they were adamant in their belief that the government had reneged on a promise of regular provisions as a condition of settlement on the reservation. Another issue for the Utes was that their children were taken away and placed in boarding schools instead of being allowed to stay at home or attend school nearby. Federal policies of the time attempted to strip away Native American culture by, in effect, removing children from families, prohibiting them from speaking in their native tongues, and initiating them into the values of the white American culture. When negotiations between the Utes and the Federal Indian Agent, Thomas Downs, failed, the Utes took up positions at the entrance to the Thunder Butte substation and threatened the use of force. At this point, about 1,000 troops were called in from Nebraska and the Utes were forced to settle. About 100 Ute men, women, and children decamped for Rapid City and a promise of a life and jobs off of the reservation. The remainder stayed on for the winter with inadequate rations and shelter and then began the long trek back to Utah under Federal supervision in June 1908.